Put the cranberries and apple into a medium saucepan with the sugar and the port and bring to a gentle boil. Add the cinnamon stick and the grated orange zest and continue to boil rapidly for approximately 10 minutes until the mixture is thick and pulpy. 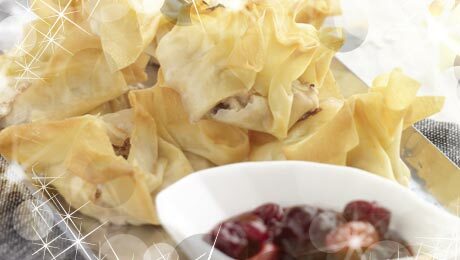 Combine the goat’s cheese and cranberry port relish in bowl and divide the filling into 12 pieces and roll it up into 12 even sized balls. Transfer to the fridge for a couple of minutes to allow to set. Cut the filo pastry into squares approximately 4 x 4 inches. Meanwhile brush single layers of filo pastry with some melted butter and lay three layers on top of each other on a lightly floured work surface. Place a ball of the filling in the centre of each piece of pastry. Brush the edges with some melted butter and then decoratively secure the parcel into your desired shape desired shape, brush with melted butter and place on a flat baking tray. Bake for 12-15 minutes until the pastry is crisp and golden brown. Serve immediately with a little cranberry relish. If you have relish left over you can transfer to a sterile jar and store until required. It will last 3 months.